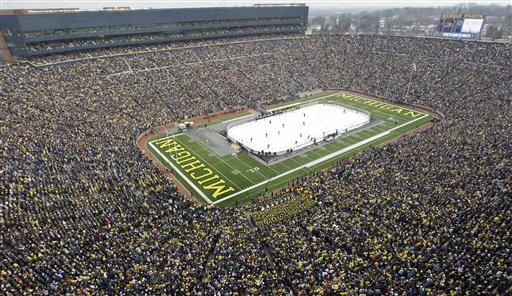 MLive.com is reporting that the 2013 Winter Classic will be between the Toronto Maple Leafs and the Detroit Red Wings on New Year's Day at the largest stadium in America, Michigan Stadium as pictured above. It will be expected to draw record NHL crowds of over 110,000 (largest Winter Classic crowd is 71,217 at the original Winter Classic in Orchard Park, NY) due to the rabid fanbases of both Original Six teams, as well as the proximity to Toronto to the area. This will also be the first time a Canadian team will be featured in the Winter Classic as only American teams, at the request of NBC, have been featured. This will be the second Winter Classic the Red Wings will have been in, having won the 2009 Winter Classic at Wrigley Field 6-4 over the Chicago Blackhawks. I'm loving this move and so is Puck Daddy's Greg Wyshynski and here are his reasons.